Bahia Todos Santos, on which Ensenada now stands, was first reached by sea by the voyager from Portugal Juan Rodríguez Cabrillo on the now famous ships called El Salvador and Victoria. The city was founded in September 17, 1542 under the name San Mateo. In 1602, while mapping the coast of the California’s in search of safe harbors for returning Spanish galleons from Manila to Acapulco, the city was renamed Ensenada de Todos Santos by the Spanish explorer Sebastián Vizcaíno who succeeded in sailing with three ships to La Paz, Baja California Sur in 1596. 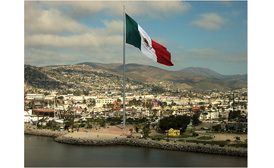 The initial permanent settlement in Ensenada was established by the Jesuits during the seventeenth or eighteenth century. After the expulsion of the Jesuits in 1768, the Dominicans took over the representation of Europe in what is today Ensenada. José Manuel Ruiz Carillo in 1805, gained permission to establish himself in Ensenada, being appointed governor of Baja California and building a house in Ensenada that remained standing until the final part of that century, despite being briefly ruled by William Walker, the self-declared “president” of the Republic of Lower California, in 1853-54. Ensenada Mexico, in 1882, was designated the official capital of Baja California, and inroads into developing the area were made by the English Mexican Land and Colonization Company. These were suspended during the Mexican Revolution, which left the area devastated. 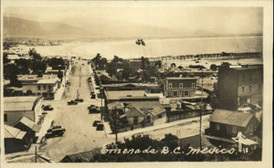 In 1915, the capital was transferred to Mexicali, and in 1930 the population of Ensenada was a measly 5,000 people. During the early part of the twentieth century, the city’s name was shortened from Ensenada de Todos Santos to Ensenada, a change made in order to eliminate local confusion with similarly named and close neighbor of Todos Santos in Baja California Sur. Prohibition played a major role in the development of Ensenada during twentieth-century when Americans and Canadians would go south of the border in search of entertainment and alcohol, developing first Tijuana, then Rosarito, and finally Ensenada as major tourist destinations. 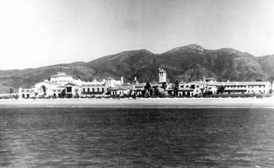 The Hotel Riviera del Pacifico (apparently where the Margarita drink was invented) opened in 1930 was the chic place to be seen in those days and, placing Ensenada on the international glamour map. Visited several times by President Miguel Aleman, international artists and political personalities the Hotel Riviera del Pacifico was both a milestone in developing the city and a magnet for the rich and famous in the 30´s and 40´s. As with all fashions, the Hotel Riviera del Pacifico was superseded and outgunned by the more impressive Hotel del Coronado which began to court the stars and jet set visiting the area. 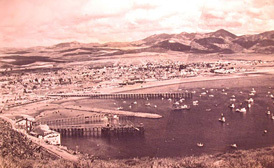 Ensenada flourished until the early 1950s, at which point Ensenada’s population had risen to 20,000. The hotel Hotel del Coronado finally closed in 1964 but was then reopened as a cultural center and museum still popular even today. From the mid sixties many other hotels opened in Ensenada to fulfill the burgeoning demand and ongoing interest in the city, and the population and economy of Ensenada had increased and diversified its touristic offer towards today’s present status. Pope Benedict XVI created the Diocese of Ensenada on January 26 of 2007 with territory taken from the Archdiocese of Tijuana and Mexicali Diocese, making it an independent dependency of the Metropolitan Church of Tijuana.